Each of the artists in this three person show present work relating to their current concerns, without any thematic restriction. 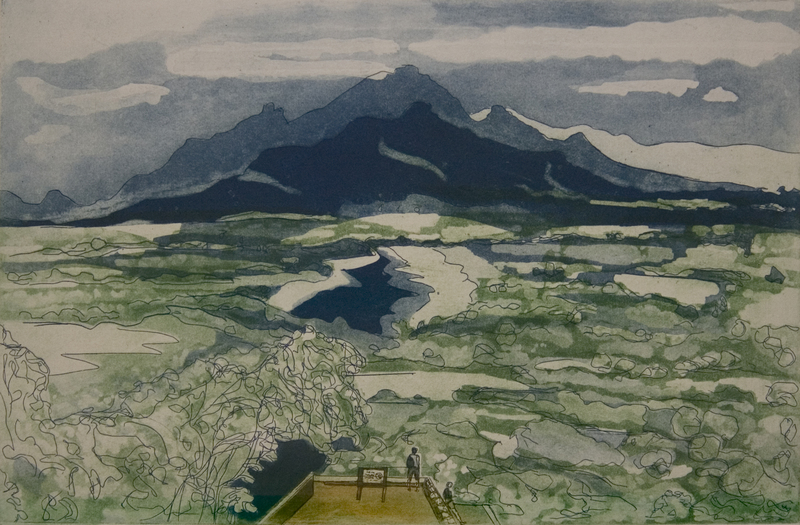 Ciara O’Hara’s new etchings and drypoints draw inspiration from her personal experiences of travelling. They provide a glimpse into these places from the perspective of an outsider. Many depict lone animals, isolated, yet confident, they are at ease, in their environment. Born in 1983, O’Hara studied printmaking at NCAD, Dublin before pursuing an MA at University College Dublin. She is a previous member of Graphic Studio Dublin and Ormond Studios, and has exhibited widely in Ireland, Iceland and the UK. Bronze sculptor Stephanie Hess, creates finely crafted stylized animals, that inhabit a fantastical world of colour and joy. The work is playful – her characters often repeated in different patinas that hint at a family unit, each different, but the same – without irony – they have a sense of tenderness. Born in 1966, Hess studied History of Art at Trinity College Dublin, and has exhibited widely, both in Ireland and South Africa, since 2004. In 2015 she was awarded the ESB Moran Award and Medal for Outstanding Sculpture at The Royal Hibernian Academy’s 185th Annual Exhibition. Maev Lenaghan’s drypoints are snippets of life. They are fragments of stories, that encourage the onlooker to engage their imagination as to the possible narratives connecting them. Her intention is to invoke a sense of place, an atmosphere, a tension or a happening. They are a form of non-linear storytelling. Born in 1979, Lenaghan studied Printmaking at NCAD, Dublin and has a Masters in Graphic Design and Illustration from Konstfack, Stockholm. She was a member of the Graphic Studio Dublin for 10 years and is presently a member of the Swedish Printmakers Societies Grafiska Sällskapet in Stockholm and Grafik i Väst in Gothenburg. She has exhibited internationally, particularly in Ireland and Sweden. The exhibition title refers to the time of year, when the exhibition will start: The Spring Equinox occurs around the 20th of March, at this time the sun crosses the celestial equator, and day and night are of roughly equal length.